Finally, a battery powered snow blower for the 21 century! The GreenWorks 80V PRO snow blower has only begun it’s dominance of the snow blower market. It was released in the winter of 2014 and has been gaining high praise ever since. My guess is that most homeowners are not even aware that this product exists. In fact, I suspect that most people don’t even know that battery snow blowers exist. If you want a snow blower with power, without fumes or extension cords then you’ve stumbled upon the best battery snow blower on the market right now. Compact, powerful and excellent snow throwing distance. This is the ultimate battery snow blower with some caveats that you’ll learn about later in this article. Truly an impressive work of engineering — the GreenWorks 80V snow blower is capable of clearing snow up to 10″ high and 20 wide. The lithium-ion battery charges in under 30 minutes and lasts up to 40 minutes (depending on usage). It has 2 LED headlights so you can easily find your way around the yard at night. View or download the MANUAL for the GreenWorks 80V snow blower. Up to 45 minutes of run-time with a fully charged 2.0AH Battery (Included). DigiPro brushless motor provides increased torque and efficiency. Battery charges fully in 30 minutes. Perfect for clearing: driveway, patios and walkway. Can clear snow up to 10″ deep. 180° Rotating Chute for desired snow displacement. Throws snow up to 20 feet. Dual LED Lights will illuminate your path at night. Folds up neatly for compact storage. 6″ rear wheels make this easy to maneuver in snow. No maintenance required. No fumes. Quiet. Rapid Charge: 30 minutes for 80V 2AH battery and 60 minutes for 80V 4AH battery. Before we get into more details I recommend watching the video below. It provides a great overview on this 80V snow blower. Note: You’ll find many more videos at the end of the article, all packed with useful information to help you decide if this is the right snow blower for you — or not for you. The sign of a great manufacturer can be determined by the length of their warranty. Well, GreenWorks provides a 4 year warranty. This is much longer than the average warranty. I applaud them for standing behind their products and supporting customers. This is an expensive tool and the 4 year warranty should provide you with confidence knowing you’re covered if your 80V snow blower fails. Nobody wants to buy an expensive tool only to have it sit in the garage because it’s not worth fixing. Four years is a very generous warranty. By the way, all GreenWorks tools have a 4 year warranty. Prepare for winter before you find yourself buried in snow. It’s true — the GreenWorks 80V Snow Blower is the most powerful model on the market. Maybe next year their will be a 120V snow thrower. Who knows? But for now, this is as good as it gets. If you want power and convenience; this is it. Technology has come a long way in the past few years. Every power type has it’s own unique strengths and weaknesses. There are many advantages of owning a battery power snow blower that far outweigh the extra cost. For starters, this GreenWorks 80V requires no maintenance, produces no fumes and is ultra-quiet. You won’t have to worry about annoying your neighbors at 3am or 11pm — they won’t hear you. In fact, my guess is they’ll be jealous of your cool new power toy. Another significant advantage is that you don’t have to wrestle with an extension cord. You know how much fun that is. That moment when you have to stop in the middle of working to untangle the cord from underneath your car tires or unhook it from the corner of some random piece of yard equipment. When buying from Amazon you get the charger and 2Ah battery. No need to spend extra money on fuel costs. Personally, I’m an advocate for battery-powered tools because they’re far more convenient to use for the average homeowner. I know some people love to tinker with their tools but Mary Anne next door just wants to get the snow cleared ASAP. Not every enjoys changing spark plugs and oil. On the other hand, if you truly need a heavy-duty snow blower because you live in a blizzard-prone area like the Buffalo, then you should look into a gas powered snow blower like the Husqvarna ST224 (24″ / 208cc). For more options I recommend you read: Best Single Stage Snow Blowers. In terms of power, a gas snow blower can’t be beat by an electric of battery powered snow thrower. They are in two different classes. Just bear that in mind when deciding which snow blower to buy. Read our full review of the Husqvarna ST224. In terms of durability, a two-stage snow blower is mainly metal whereas the 80V GreenWorks snow blower has mainly plastic. It’s durable but it can’t handle the abuse and pounding that a gas snow blower can endure over the years. But, a 2-stage gas snow blower is also more expensive, so you have to weigh the cost and benefits — more importantly, you need to decide on what you need. For example, if you live in Seattle, you don’t need a gas snow blower because the winters are mild. But, if you live in New York or New Jersey then you should probably spend the extra money and get a gas snow thrower — you’ll need it. Weighs only 32.5 lbs. Light enough for anyone to use. GreenWorks makes exceptional products across the board. If you look at their average ratings on Amazon you’ll be amazed. Every product is consistently rated very high. In other words, homeowners love their products because they pack a lot of features into every lawn and garden tool while keeping the costs very affordable. If you’re interested in the competition for the GreenWorks 80V, well the Snow Joe iON18SB is an fantastic alternative. It’s not as powerful, but it can hold it’s own against any winter storm. This battery snow thrower from Snow Joe is an excellent model that has a history of dependability that can be tracked by reading customer feedback since the winter of 2013. It’s been on the market one year longer than the GreenWorks 80V. It may not have the same bragging rights as the GreenWorks in terms of raw power rating but don’t be fooled. It’s powered by a 40V battery system — but that doesn’t mean it’s half as powerful. Voltage doesn’t translate that way. I won’t go into the details here but you can read everything you need to know in our in-depth article on the Snow Joe iON18SB. An excellent 40V snow blower that will satisfy most homeowners. The GreenWorks 80V Snow blower is an excellent machine, and the Snow Joe iON a fantastic alternative to consider. Preparation for winter starts now — get ahead of your neighbors. The mistake most homeowners make is to wait for the first snowfall before preparing for winter. Unfortunately, it’s too late once the first major storm buries your city or town because everyone else is also trying to buy snow blowers, snow shovels and anything else they can get their hands on. You may be one of the lucky ones to get your hands on the last snow blower in Home Depot but there’s never enough to go around for everyone. My recommendation is to plan ahead. If you live an an area with heavy snowfall year after year then buy your snow blower long before a blizzard hits. Remember, this is a long-term investment, even if this turns out to be a mild winter, you can use it next year. It’s human nature to wait until a crisis before taking action but if you truly want to being blind-sided by mother nature then prepare as soon as possible. Trust me, you’ll sleep better at night. Winter will start mild then transition to typical weather patterns. The El Niño for the winter of 2015/16 is described as “godzilla” in size and is shaping up to be one of the strongest on record. Why am I bringing up El Nino in this article on the GreenWorks Snow Blower? Well, El Nino has a significant influence on the weather and it will impact you this winter. In a nutshell, El Niño will affect the relative temperatures of the states. During typical El Niño year, the northern portion of the USA experiences a winter that’s warmer and more mild than usual, and the South experiences a cooler and colder climate than normal. Also, El Niño tends to bring more storms which can mean a lot of rain if the temperature is mild or massive snowstorms in the colder regions of the country. El Nino introduces a lot of uncertainty in the upcoming winter season. I would suggest you prepare yourself according to where you live. If you live in Seattle you might just need a really good umbrella and not a snow blower. And if you live in California, you’ll be happy to know that you will likely get a lot of rain to alleviate the years of drought. What are the predictions from the experts? Save money in the long run. All you need is one battery. I’ve written extensively about other GreenWorks tools — most recently the 80V chainsaw. GreenWorks has a full line of 80V power tools. One battery powers them all. In the long-run it’s more economical to own multiple tools of the 80V series. For example, if you need a lawn mower then buy the GreenWorks GLM801600 80V and you won’t have to spend money on another battery because you can buy the tool separately. Think long-term and calculate the cost compared to buying different brands and paying for a new battery with every power tool. ✓Read the original Press Release Oct 23, 2014 : Introduction of GreenWorks 80V Tools. Snow can fall anytime — day or night. These lights will guide the way. battery to warm. Remove from charger and install in Snow thrower for use. These are costly, but a good idea if you have a large area to clear. 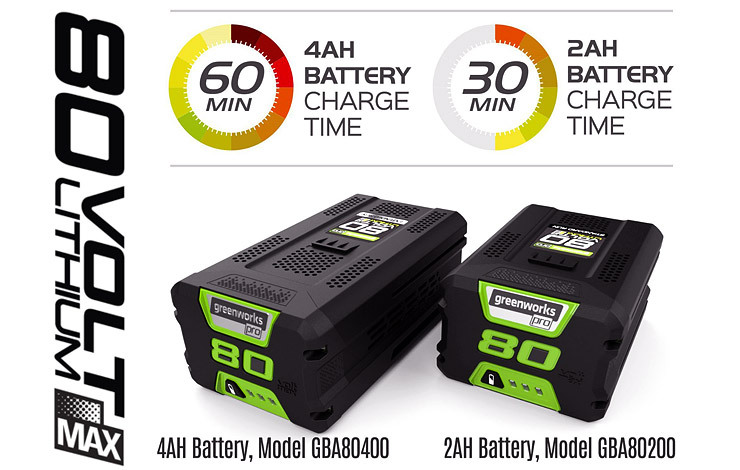 GreenWorks says that the included 2Ah battery lasts up to 40 minutes, but under real-life conditions it’s somewhere between 20 to 35 minutes. It And consequently, the battery will last longer when clearing light fluffy snow. If you don’t want to be left without battery power during a storm then I suggest getting an extra battery. They are expensive, but remember, these are 80V batteries. If you can afford it and you live in an area where you expect heavy snow fall then you should seriously consider a back-up. Luckily, the 2AH battery that comes with the GreenWorks 80V only takes 30 minutes to charge so it’s not a major inconvenience to plug-in your battery for a recharge while you warm up with a hot chocolate or a bowl of soup. Personally, when I start something I like to finish. I’d be really annoyed to have to stop to charge the battery. But that’s my own preference. Lithium-Ion battery offers fade free power. Blower won’t slow down during operation. East to read battery “fuel” indicator. Compatible with all 80V Pro power tools, One battery for a complete system. Compatible with charger model GCH8040 (included). A brushless motor is superior to the traditional brushed motor. It’s a newer technology that GreenWorks has incorporated into the heart of their 80V snow blower. Brushless motors offer several advantages over brushed DC motors, including high torque to weight ratio, more torque per watt (increased efficiency), increased reliability, reduced noise, longer lifetime (no brush and commutator erosion), elimination of ionizing sparks from the commutator, and overall reduction of electromagnetic interference (EMI). With no windings on the rotor, they are not subjected to centrifugal forces, and because the windings are supported by the housing, they can be cooled by conduction, requiring no airflow inside the motor for cooling. This in turn means that the motor’s internals can be entirely enclosed and protected from dirt or other foreign matter. Learn more about brushless motors by watching this video. Basically, brushless motors last longer, produce less heat, are more efficient and use less battery power, therefore increasing your overall battery life and efficiency. Watch the videos for the GreenWorks 80V snow blower below — but, if you’re thinking you need more power then we’ve got you covered also. For more heavy-duty snow clearing options read our full feature article: Best Two Stage Snow Blowers. You can tell a company believes in their products because they put in the time, money and effort to make high-quality instructional videos for it. In this, GreenWorks is truly a company that stands behind its products. I’m a big fan of GreenWorks and their tools because they are innovative, affordable and packed with features. As someone who spends a lot of time researching products I’m thrilled to spotlight GreenWorks because they truly care about their products, reputation and most importantly, their customers. These videos help consumers make a buying decision. It’s wonderful to be able to see a product in action before you decide to buy it. Thankfully, the GreenWorks 80V Snow Blower is worth every penny. Keep the area of operation free of foreign objects that can become thrown by the impeller. Perform a thorough inspection of the area since some objects may be hidden from view by surrounding snow. lf the snow thrower hits an obstruction or picks up a foreign object during use, stop the snow thrower, remove the battery, remove the obstruction, and inspect the unit for damage. Repair or replace any damaged part before restarting and operating the unit. Keep children, pets, and bystanders away from the area of operation. Be aware that the normal noise of the machine when turned on may make it difficult for you to hear approaching people. When moving the snow thrower, use the wheels on one side as the pivot point. Slightly tilt the snow thrower on this pivot point to move it forward or backward. Start your clearing path outward, throwing snow in a back and forth motion. To clear in the opposite direction, pivot the snow thrower on its wheels. Make sure to overlap clearing paths. Note the wind direction. If possible, move in the same direction as the wind so that the snow is not thrown against the wind (and thus back onto you and on the just cleared path). Do not push the snow thrower with excessive force. You should push the machine gently and at a consistent speed in accordance with the unit’s throw rate. Some parts of the snow thrower may freeze under extreme temperature conditions. Do not attempt to operate the snow thrower with frozen parts. if the parts freeze while the snow thrower is in use, stop the snow thrower, remove the battery, and inspect for frozen parts. Free all parts before restarting or operating the snow thrower. Never force controls that are frozen. When working on pebbles, gravel, or unpaved surfaces, avoid throwing loose surface material along with the snow by pushing down on the handle to raise the scraper at the base of the unit above the pebbles or gravel. Cold Weather Operation: Lithium ion batteries can be safely used from temperatures ranging from -17 degrees to 45 degrees Celsius. NOTE: Do not store or charge battery outside. Battery must be charged and stored indoors prior to use of the snow thrower. If the Snow thrower does not start initially remove battery from snow thrower. Place battery on charger and allow to charge for 10 minutes. Remove from charger and install in Snowthrower for use. The start-up issue may be caused from the battery being too cold. To avoid this issue, ensure battery is stored in a dry cool place for storage and charging and leave indoors until ready for use. Verify that the snow thrower is not in contact with anything before turning it on. Stay away from the discharge chute and impeller openings at all times. Keep face, hands, and feet away from concealed, moving, or rotating parts. Be attentive when using the snow thrower, and stay alert for holes in the terrain and other hidden hazards or traffic. Do not use the snow thrower on a gravel or crushed rock surface. Use extreme caution when crossing gravel/crushed rock drives, walks, or roads. Move up and down slopes when clearing snow. Do not go across a slope. Use caution when changing direction. Do not use this snow thrower to clear snow from steep slopes. Do not attempt to use the snow thrower on a roof or on any steeply inclined slippery surface. Do not operate the snow thrower if the guards, plates, and other safety protective devices are not in place. Do not operate the snow thrower near glass enclosures, automobiles, trucks, window wells, drop-offs, etc. without properly adjusting the angle of the snow discharge. Keep children and pets away from the work area. Do not force or overload the snow thrower. The snow thrower will perform better and safer when it is used at the rate that it was designed to work at. Do not operate the snow thrower at high speeds on slippery surfaces. Look behind when backing up and exercise caution. Do not direct the discharge toward anyone. Do not allow anyone to move in front of the snow thrower while it is in use. Wear safety glasses or goggles that meet ANSi Z87.1 standards. Use the snow thrower in daylight or in good artificial light. If using at night, turn on the LED lights and be aware of your surroundings. To avoid accidental start-ups, remain in the starting position when turning the snow thrower on. The operator and the snow thrower must be in a stable position during start-up. See the section titled Starting/Stopping instructions. Use this snow thrower only for the purposes it was designed. Do not overreach. Always keep proper footing and balance. Hold the snow thrower with both hands while it is in use. Keep a firm grip on the handles. If the impeller does not rotate freely due to ice, thaw the snow thrower thoroughly before attempting to use it. Keep the impeller clear of debris.